Huge Savings Item! 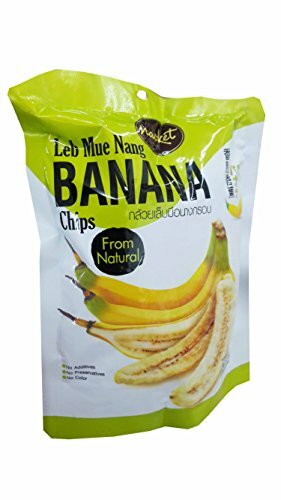 Save 11% on the 3 packs of Leb Mue Nang Crispy Banana chips from natural, Delicious Fruit Snack by Nacket, Thailand. (43 g/pack) by Nacket at Smokey Robinson Foods. Hurry! Limited time offer. Offer valid only while supplies last. Leb Mue Nang Banana chips with natural taste. Vacuum frying process. No preservative and artificial. No additives. No color. Freshness hygienic healthy and full of nutrition. Ingredients: Leb Mue Nang Banana (98.5%), Palm oil (1.5%). Ready to eat, high quality & delicious fruit snack, Storage: Once opened the product should be consumed immediately. Leftover portions can be stored in an air-tight container and kept in a cool, dry place. If you have any questions about this product by Nacket, contact us by completing and submitting the form below. If you are looking for a specif part number, please include it with your message.